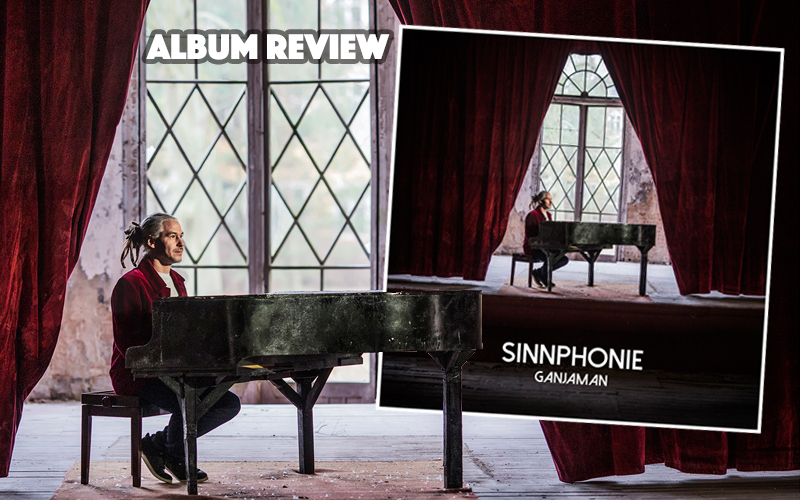 "And thus the red curtain opened amidst the ruins of the old hall to reveal a single man on stage, bent over his piano in deep reflection..."
For his new album Sinnphonie, the gentle rebel, freedom- and justice-fighter Ganjaman outta Berlin chose title and cover carefully, and both are laden with symbolism. "Sinn" is the German word for sense or meaning, combined with the term "phonie" to describe the listening experience waiting for you. The allusion to the word "symphony" is no coincidence, either – the release is an instrumental opus! Produced and recorded by Sam Gilly (House Of Riddim) and Ganjaman at their respective studios (Karlstetten and Growkammer), the multi-talented artist himself played drums, percussions, keyboard, guitar and even saxophone on some of the 15 tracks included. Apart from him, some of Germany's leading Reggae-musicians contributed their art: Giuseppe "Big Finger" Coppola, Herb Pirker, Manfred Scheer, Parvez Syed, Marco Baresi, Fabian Zepezauer and Rene Flächsenhaar, to name but a few. Despite this musical awesomeness, the focus of the release lies definitely on the lyrics. The range of diversity is rather low, both in vocals (there are no features that distract from Ganjaman's voice) and riddims, which all range between Roots Reggae and Modern Roots. A notable exception is the last track Der Grund, a tender ode to a future child. The intro is goose-bumps!!! Since not all of our readers are fluent speakers of German, and since the lyrics are so essential to this work, I will quote the singer as much as possible to give you an idea of the profoundness of the words and the subjects treated. Over the years, the artist has kept up a consistent mission to sing (and talk) about issues such as participatory action, global justice, defence of personal rights and freedom, unification, mutual understanding and empathy. The first song Sie Hören Einfach Nicht Zu is already one of the highlights of the release, combining melody and message: "Greetings to one and all, trust me I won't give up hope that the world finally wakes up. They don't listen, they don't even take a look, they don't do anything, ignoring every question and every complaint." Further attention to the injustices committed by the ruling elite and the power still held by the aristocracy worldwide is drawn in Steh Uns Bei ("How many tears does this world have to cry until the divided will unite?") and Selbstgefälligkeit. Der Rollende Stein asks when we will finally unite, while Stumm, Taub Und Blind is once again holding up a mirror to the warmongers. Mit Pauken Und Trompeten calls on us to stand up and no longer accept the wrongs wrought by our leaders. Likewise, Ball Die Faust encourages us to clench our fist and not accept what we think is wrong: "Power in the wrong hands is much too dangerous, so resist, defend humanity and multiply". Interesting here are the little sound snippets strewn in between the notes of the song, and the remarkable speech of Severn Suzuki at the UN Earth Summit in Rio 1992 at its end. In a similar manner, Nur Mit Uns empowers the people. Ganjaman reminds us that there is no government without people who are governed. Without us, nothing is possible, he states the simple truth: "They seduce us and betray us, they spread fear and terror and divide us, they poison us and lie to us, but they forget that nothing is possible without us!" Die Zeit Läuft Davon is encouraging us again to take action, this time on an uplifting, joyous beat. The expression of an attempt to reach out to a fellow human being, Die Welt Aus Deinen Augen is trying to see the world from another one's perspective. This is an important skill and should be practiced by everyone to overcome the ego so blatantly present in Western societies. "The distance between us is only a hand's breadth, so even the deepest divide is not unbridgeable." Some of these words take some deep meditation to be fully understood! Alles Was Du Brauchst also turns to "the other", wishing him or her everything he or she might need. And Ist Die Angst So Gross, on a relaxed beat including a wonderful Spanish guitar, directly speaks to those who are afraid or angry, telling them to let go of these harmful emotions. Heavy stuff, as you can see. After all this deep pondering, it is relieving to follow comparably lighter tunes such as Die Sonne Küsst Dich Wach (which celebrates the new dawn after a dark night) and Sternenstaub, both of which lift the serious mood considerably. I'm not sure to what extent non-German-speakers will enjoy and appreciate the release. What I am sure about is that those who do understand the lyrics will spend the following days reflecting on what they've heard. Good! That's what Sinnphonie has been created for. Two things are important to keep in mind. First of all, you are not alone. Secondly, your voice, your action, your resistance against all that's going wrong on our planet counts and is badly needed. Or, as Ganjaman says: "Don't worry because everything that's not good will be fine. Don't be afraid, peace will be where there is no anger. Your heart is heavy because it is made of pure gold!"